Efforts to meet the demand for an updated Veterans clinic in Pahrump will take giant step forward today as area veterans and dignitaries come together for a special groundbreaking ceremony at the site adjacent to Desert View Hospital. The 11 a.m. ceremony comes after many years of bureaucratic red tape holding up the $12.1 million project along Lola Lane. Dr. Tom Waters, USAF Lt. Colonel (Ret), said today could not come soon enough for he and other area veterans. Since 2012, Nevada lawmakers have pressed the veterans administration to move forward on a new Pahrump VA clinic. The original target date for a construction contract was Sept. 30, 2012. VA officials said the project became mired within the bureaucracy, where lawyers got involved after questions were whether the VA had the proper authority to move forward with the project. Waters, who has been following progress from the beginning stages, said veterans will be able to receive numerous services in a state-of-the-art facility. The Neenan Company, based on Colorado, will build the 10,000-square-foot outpatient clinic, which will eventually replace the smaller VA clinic in Pahrump. Waters, meanwhile, said he’s anticipating a large turnout of retired veterans, active duty personnel and elected officials. U.S. Sen. Dean Heller announced Thursday he will attend the event. In July 2014, Senator Harry Reid and then-Rep. Steven Horsford urged VA officials to explain the project delays and were told construction would begin last fall. U.S. Rep. Cresent Hardy, R-Nev., picked up advocacy for the project after unseating Horsford for the congressional district, which includes Pahrump. Administration healthcare clinic in Pahrump, Nevada. The groundbreaking celebrates a highly anticipated milestone in meeting the demand for an updated VA clinic within the community. square-foot community-based outpatient clinic. Neenan is partnering with government real estate specialist WD Schorsch LLC/Pahrump VA LLC for the government leaseback project. The new facility will replace a smaller VA clinic and, with a modern facility, will ultimately be able to better serve the healthcare needs of a rural area with an expanding veteran population. The medical clinic will be built to LEED Silver certification standards. Upon completion, the project will include exam rooms and procedure rooms, providing expanded space for a wide range of services including primary care, women’s health, mental health, social work, laboratory procedures and a wide range of telehealth subspecialty services. The groundbreaking ceremony will be held at 11 a.m. on Jan. 29 at 220 South Lola Lane in Pahrump. The clinic is expected to open at the end of 2016. The Neenan Co. was selected as the design-build partner for the Colorado Department of Transportation’s Region 2 office and maintenance campus. CDOT Region 2 plans to build a unified campus in the Pueblo area for its office, maintenance and traffic facilities that serve Southern Colorado. The Neenan Co. was awarded the project through a competitive selection process. The Neenan Co. also recently designed and built CDOT’ s new Region 4 headquarters, its first build-to-suit office building in more than 30 years, as well as a new maintenance facility, which were both completed in 2015. The Neenan Co. also recently celebrated the company’s 50th year in business with its headquarters moving to a 40,000-square-foot office building in Fort Collins – a building the firm originally designed as an industrial facility in 1995. The space features modem, streamlined details combined with Colorado beetle kill wood and other outdoor-inspired design elements. A combination of both open and closed workspaces as well as upgraded natural light and LED technology contributes to the ambience of the office, the firm noted. A glass garage door in the break area and windows that open to the exterior enhance the connection to the outdoors. The Neenan Co. also incorporated elongated conference rooms to promote conversation as well as streamlined teleconferencing capabilities to ensure seamless communication to job sites around the country. The office includes a layout and design that facilitates impromptu discussions and team productivity, according to the firm. Additionally, the company “embraced” appropriate acoustics within the space, which features a balance of open desk areas and high ceilings with acoustic capabilities. Evidence from research indicates that conceptual models of construction management often fail to delivery projects on time, within budget, and with high quality. The mismatch between these models and reality highlights the need for a theory of production in construction. But, designing a production system to achieve the best outcome is only possible through the collaboration of all project participants. Therefore, the Lean Construction Institute (LCI) has translated the principles of Lean business management to the design and construction industry. When building CDOT’s Region 4 complex, the goal for Neenan Company was to use Lean principles to avoid “average outcomes” that arise from a traditional design and construction process. Learn what is important to your client by asking questions, then allowing them to prioritize. The result is a “Conditions of Satisfaction” list that is used to guide the team in project decisions to create the right outcomes for your unique client. CDOT’s Region 4 leadership team wanted a 21st Century workspace to attract and retain employees. The result is an office building with contemplative and collaborative spaces that will be LEED (“Leadership in Energy & Environmental Design”) Certified. Value decisions are also made based on Conditions of Satisfaction for other facilities that Neenan has designed and built for CDOT using “Lean Construction” principles, including the Twin Rivers Maintenance Facility in Platteville, Colorado. For example, for that facility, $26,000 was saved by eliminating paint from columns which had already been primed by the manufacturer. Using a “Collaborative Design Process” — which is basically a “boot camp” to launch a project — the CDOT Region 4 HQ team worked on big picture concepts over a few hours rather than months. Then, CDOT’s New Building Initiative Team saw the project through move-in with regular design reviews. The central interchange in the R4 Headquarters where people can meet, brainstorm, and build culture was created from the original outdoor courtyard space as a result of this process. In the 1980’s, Neenan began to see waste and poor client outcome in their construction process. It was this realization that shifted Neenan from a being just a “contractor” to an integrated design-builder — with architects, interior designers, preconstruction estimators, project managers, and superintendents under one roof. This approach allows the Neenan team to be the single source of responsibility for a specific project, like the R4 HQ, while working more efficiently and less litigiously. For the Region 4 facility, existing CDOT operations were maintained while construction was Good information flow is critical. Everyone on team – CDOT, Neenan, and subcontractors – have constant access to the latest drawings and specifications from any computer or tablet. This allows CDOT project managers to provide feedback and saves information transfer time and printing costs. Working from the end date backwards, the project is divided into big milestones. With Neenan’s use of the integrated design-build process, these key milestones can overlap to shorten a schedule and allow more time for owner decisions. To ensure that all design preparation is ready and materials are on-site when needed, Neenan uses a weekly work plan to hold team members accountable. For instance, on CDOT’s Twin Rivers Maintenance Facility, the metal building supplier was involved in planning to make sure the schedule was met and make-ready needs were complete. One of CDOT’s six core values is “Excellence”: We are leaders and problem solvers, continuously improving our products and services. This is also a key principle for Lean Construction, and was directly applied for the facilities built in Region 4. Nennan completed CDOT’s Twin Rivers Maintenance facility first before tackling the Region 4 HQ facility. From the Twin Rivers experience, Neenan learned a lot, and improved what it did. For instance, from Twin Rivers, Neenan learned about CDOT’s specific desire to increase the reinforcement of concrete beyond what Neenan typically does. This “lesson learned” was transferred directly to the Region 4 HQ design, and will also be included in the design for the new Region 2 Headquarters facility. The Neenan Co., a design-build firm based in Colorado, has moved its headquarters to a new office space within its latest redevelopment project in Fort Collins. The move coincides with the company’s 50th year in business. The multi-tenant, 40,000-sq-ft, redeveloped office space is located at 3325 S. Timberline Rd., the site of the former Value Plastics building. The two-story building has historical significance to the firm, as The Neenan Co. originally designed it as an industrial facility in 1995. Design elements of the new office feature modern, streamlined details combined with Colorado beetle-kill wood and other outdoor-inspired design elements. A combination of both open and closed workspaces as well as upgraded natural light and LED technology contributes to the ambience of the office. A glass garage door in the break area and windows that open to the exterior enhance a connection to the outdoors. The Neenan Co. incorporated elongated conference rooms to promote conversation as well as streamlined teleconferencing capabilities to ensure seamless communication to jobsites around the country. The office includes a layout and design that facilitates impromptu discussions and team productivity. Additionally, the company has embraced appropriate acoustics within the space, which features a balance of open-desk areas and high ceilings with acoustic capabilities, fostering a collaborative and productive working enviroment. The development firm The Neenan Co. is starting its 50th year in business with a new office in Fort Collins. The company founded in 1966 moved into a recently renovated office in southeast Fort Collins over the holidays, according to a news release sent Tuesday. The company employs about 125 workers in the Choice City. Neenan relocated from 2607 Midpoint Drive to an office it recently redeveloped at 3325 S. Timberline Road. In July, the company paid $3.7 million for the 40,000-square-foot building. Neenan designed the building in 1995. The space later housed the Value Plastics company. The Neenan Co. recently was awarded the 2015 Urban Design Award for Sustainable Design by the city of Fort Collins for its work on Colorado State University’s Powerhouse Energy Campus. The Neenan Co. was honored with this biennial award that recognizes projects that improve the quality of life in Fort Collins. The firm oversaw the design and construction of the project. The Powerhouse Energy Campus is CSU’s expanded research facility, which includes the remodeled Engines and Energy Conversion Lab and a 65,000-square-foot addition that houses new office and research space. The project achieved LEED Platinum status, a goal that guided all of The Neenan Co.’s design and construction decisions throughout the process. The Neenan Co. also utilized a holistic approach and comprehensive modeling to achieve the building’s performance standards, the firm added. ‘Powerhouse co-directors Dr. Willson and Dr. Morgan DeFoort took a bold step and presented us with a valuable opportunity for new development and leadership in the realm of building systems and building behavior.’ – Bob Hosanna, The Neenan Co. The LEED design features of the project include the building’s rooftop, which incorporates solar panels and wind turbines to create energy and boost the building’s long-term sustainability, a 26-mile tubing network circulating chilled water throughout the building’s structural system and into the caisson foundation rather than a traditional air conditioning system, an exterior of pre-finished interlocking metal panels to prevent air leakage from the interior, fiberglass window frames and glass panes for a higher efficiency rating, and customized low-voltage LED lights that attach to the ceiling with magnets and whose heat is absorbed by the floor slabs and redistributed throughout the building. The system design significantly decreased project costs and the campus achieves about 50 to 55 percent energy savings. “Powerhouse co-directors Dr. Willson and Dr. Morgan DeFoort took a bold step and presented us with a valuable opportunity for new development and leadership in the realm of building systems and building behavior,” said Bob Hosanna, architect for The Neenan Co. This three-story, 106,862-square-foot outpatient facility houses a multispecialty clinic practice, an ambulatory surgery center and other outpatient services. The new customer/patient experience begins at the pre-visit digital dialogue and continues through arrival, navigation and discharge pathways, supported by modified data- and metrics-driven protocols. The shift toward the transformational customer experience introduces new variables related specifically to the patient experience, which need to be optimized in addition to traditional operational variables such as staff utilization, resource utilization, durations and revenue. 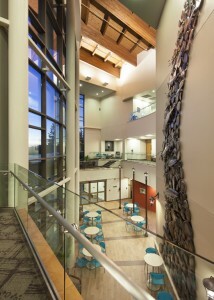 The public spaces at Coquille Valley Hospital are derived from those in modern hotels. Open and daylighted spaces are easy to navigate and anchored on the new café, a community gathering place. Innovative healthcare organizations believe that, indeed, it is possible to achieve, meet and exceed operational targets by focusing on this new driver: the transformation of the patient experience into a customer experience. On the other hand, the transformational customer experience has been the foundation of success for every other industry from consumer electronics to telecommunications to hospitality. Likewise, when a healthcare organization initiates operational optimization via a focus on the goals of the transformational customer experience, it is a win-win strategy. A patient/customer-centric approach to care is also incentivized by the availability and great speed of communications and social media, which enable consumer comparisons. For example, the PriceWaterhouseCooper Health Research Institute surveyed 1,000 consumers in late 2012 to assess the state of healthcare ratings (http://www.pwc.com/us/scoringhealthcare). Nearly half (48 percent) of consumers said they have read health-related reviews, including patients’ reviews in social media, and one-third have used reviews to make decisions on where to get care. Optimization of access. Pre-visit protocols, information data harvesting and processing, wayfinding and navigation require modification of spatial and operational variables. The electronic health record data can be used to guide significant improvements in patient/customer registration, admission and processing. Similarly, new communication technologies enable distinct navigation and wayfinding solutions, such as information kiosks, interactive electronic signage systems and personal digital assistant devices. Indeed, the new customer/patient experience commences at the pre-visit “digital dialogue” with the call center often referred to as the customer portal and continues through arrival, encounter protocols and discharge pathways supported by significantly modified data- and metrics-driven protocols. The call center is a powerful tool that leverages the immense and broad capacity of the new digital information data banks. Through this interactive port and communication pathway, customer/patients and the organization exchange information regarding demographics, health conditions, insurance, appointment needs and outcomes. The center also links care management protocols, quality and utilization metrics and navigation resources. For example, Mercy Clinic in Rolla, Missouri, built a three-story, 106,862-square-foot outpatient facility housing a multispecialty clinic practice, an ambulatory surgery center and other outpatient services. Staffed at 0.5 FTE per care giver, the new customer center at the St. John’s Clinic is the epicenter of health information management, while also improving resource utilization (leveling) and vastly improving service quality. Located in a 1,800-square-foot suite within the building, supported by approximately 22 staff representing nursing, medical assistants, scheduling, billing and care coordinators, the customer center has become the main contact point for all patients. Appointments, billing inquiries and care coordination affairs are effectively managed. Additionally, the customer center assists in distributing services and is a resource-leveling tool. Over time, many hospital campuses have evolved into mazes that are difficult to navigate. Technology is assisting with physical access and wayfinding within these campuses. Navigation apps, touch-screen kiosks, sounds, lights and color are used to guide and lead users to the many destinations within the medical center. For example, the Carle Foundation Hospital is a 345-bed regional care hospital and Level 1 Trauma Center spanning over several city blocks in Urbana, Illinois, with a need to transform patient navigation/wayfinding. After several months of study and design, supported by Lean concepts and digital modeling, a multi-tier solution has been developed by The Neenan Company and will be installed this summer. The solution defines entry gates and creates circulation nodes, which, when linked by color- and graphic-coded pathways, becomes the new multi-technology wayfinding system. Traditional signs are the familiar tool; however, color, shapes, textures and sound add significant additional reinforcement. Electronic, interactive and video displays are introduced to further support the customer with PDA devices including apps and web pages. Optimizing quality and safety. Quality and patient safety have always been essential elements of the healthcare industry. Traditional quality measurement was symbolic and only geared toward accreditation and regulatory compliance. The healthcare law introduces specific targets that are associated with payment formulas, which must be met by health plans and healthcare organizations. These variables are reported with transparency, allowing users to clearly evaluate care decisions. Several publicly accessible grading and comparison tools, such as Healthgrades, are easily available through the Internet. Barton Health serves community members and visitors to the Lake Tahoe and Carson Valley, areas. The Tahoe Center for Orthopedics is a nationally recognized, comprehensive program for orthopedic excellence focusing on quality and patient-centered, personalized care, including prevention and wellness, non-invasive treatments and surgery and rehabilitation, to enable patients to return to a fully mobile lifestyle. Existing services have been housed in the hospital and an orthopedic clinic several blocks away, forcing patients to travel among departments and buildings to access the full range of services. To support and expand the mission of this program, Barton Health has commenced the development of a new Wellness Center of Excellence. The design of a new 27,000-square-foot facility adjacent to the hospital significantly consolidates and integrates related services to optimize access and delivery, without duplicating costly hospital-based services and equipment, such as MRI. A formerly separate wellness and fitness training center also will be incorporated into the same center. Leveraging high-altitude training will also offer the market a carefully defined athletic program and service line. A covered parking garage is attached to the center. Optimizing the experience. Today’s healthcare organizations can achieve speed and consistency of service without compromising the patient/customer experience, including privacy, comfort and convenience. To this end, the facility solutions and the intent of healthcare organizations match those of the hospitality industry. As a result, the sterile, imposing and institutional appearance is being replaced by hotel-like lobbies where comfort is paramount. Daylight and environmental sustainability are also demanded by communities, and healthcare organizations have accepted the challenge to deliver facilities with greatly improved performance. Coquille Valley Hospital, a critical access hospital in Coquille, Oregon, exemplifies the new commitment to addressing customer needs with a transformational experience for the patient/customer, family and community. The replacement hospital introduced private, single-occupancy patient rooms supported by interventional programs and public spaces derived from those in modern hotels. Open and daylighted spaces are easy to navigate and are anchored on the new “café,” which has become the community’s gathering place. Further, the transformational experience ensures compliance with HIPAA and accessibility while optimizing flow. A patient-centric design supported by Lean concepts and digital modeling brings services to the patient instead of the reverse. It is about service, convenience and deliberate effort to deliver value for the customer. Healthcare innovators have shifted from the traditional organization-centric approach toward a patient/customer-centric approach to care. They are using metrics, Lean concepts and digital modeling at all phases of this process to measure their outcomes and foster continuous improvement. Leveraging a growing body of metrics and benchmarks to optimize patient stay durations reduces wasted resources and inventory. Indeed, it is a win-win strategy. Photos courtesy of LaCasse Photography. For over 35 years, Miguel Burbano de Lara, AIA, NCARB, has followed a passion for healthcare design. He has worked at The Neenan Company since 1999, where he focuses on Lean theory, design innovation and accelerated delivery. HAZEN, N.D. — The Neenan Company, in partnership with Sakakawea Medical Center, has broken ground on a new medical center in Hazen, North Dakota. The new facility will replace the existing medical center and will enable the Sakakawea Medical Center to serve as both a critical access hospital and a primary care medical home to meet the emergency needs of the rural community and to promote the long-term well-being of the region through wellness and prevention programs and services offered beyond the hospital walls. The Neenan Company is the design-build partner for the Sakakawea Medical Center project, which will feature a modular design allowing for maximum flexibility for patient care, as well as a care team space that will facilitate high-performing teams comprised of physicians, clinicians and administrators to guide care delivery programs and patient engagement strategies. The groundbreaking ceremony took place on Oct. 14, with an anticipated completion in December 2016. 2014 Marketing Beer To Women Workshop: Invite | Women Enjoying Beer on New Belgium Brewing Co.